The Gift of Soccer was pleased to donate dozens of cleats to support the Notah Begay Foundation. Shannon Adragna, the Soccer Program Manager said the cleats are a welcome addition to the other equipment and really helps to keeps kids engaged and coming back to participate in the programs. Notah Begay III, a 4-time winner on the PGA TOUR and only full-blooded Native American golfer, started the foundation to address the negative impact type 2 diabetes has had on his family, tribal community and Native Americans throughout the United States. Starting with a golf program headed by Notah’s father, Notah Begay Jr., Native American youth from the greater Albuquerque area were introduced to golf, a sport often out of reach for both rural and Urban Native American youth. This program served as an introduction to the positive impact sports can make on a young person’s life: discipline, goal-setting, etiquette, pride and health. As the Notah Begay III Foundation’s (NB3F) scope and reach expanded, additional programs were created to further address prevention of type 2 diabetes. In 2009 NB3F launched a comprehensive health and wellness program to ensure a holistic approach in fighting the epidemics of type 2 diabetes and childhood obesity among Native American children. 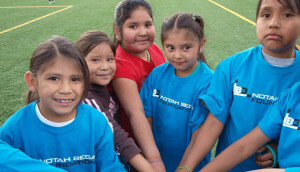 Additionally, the foundation initiated an innovative soccer program at the San Felipe Pueblo, which included the first-of-its-kind professional sports field at a Pueblo.